Celebrating the centenary of the Felix Cobbold Trust. To mark the Trust’s centenary the Trustees commissioned a book to chart the development and growth of the Trust through its first 100 years and to set their objectives for the foreseeable future. The book is much more than an account of the development and progress of an agricultural charity; it reflects the history of farming in Suffolk, and indeed of the major arable areas of England, throughout the 20th century. The author, Ros Thomas, records the foundation of the Trust from a bequest of Felix Thornley Cobbold during the difficult days of the early 20th century, through the deprivation of the great depression, the shortages of the Second World War and the security of farm commodity price support, into the new millennium. Felix Thornley Cobbold was a Victorian philanthropist who used his wealth for the benefit of the people of East Suffolk. In addition to his gift of land and money for the establishment of allotments and smallholdings, he also bequeathed Christchurch Mansion to Ipswich town. Ros Thomas shows how political and social changes have affected farming, and how the Trust has responded and evolved to help fulfil its Founder's vision of a better and fairer rural economy. From providing self-employment opportunities for a few labourers in a handful of parishes in East Suffolk Ros Thomas explains how the Trust's influence on agricultural improvement has evolved to support important projects at some of the major research institutions in Great Britain. Through her painstaking research she has identified the people who have shaped the Trust through the years. The Trust began with 861 acres in 27 tenancies and very little money. At the end of its first century it had property worth £6million and another £1million invested, yielding £204,232 in rents, dividends and interest. The final chapter looks to the future and how the generous endowment of Felix Thornley Cobbold can continue supporting agricultural education and development in East Anglia. 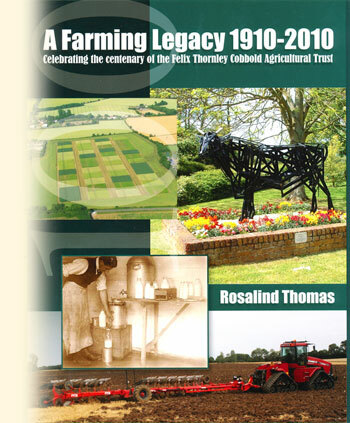 Copies of A Farming Legacy 1910 – 2010 are available from Old Pond Publishing Ltd, Dencora Business Centre, 36 White House Road, Ipswich, IP1 5LT. the New Century' in the final chapter.' (41Kb).